Sorry this took so long, but we have been pretty busy trying to get stuff organized and purchased for a little venture we decided to do this weekend (in a hurricane). I traded this card, which I liked pulling but really didn't care for at all. And I was able to get this card, which I like. 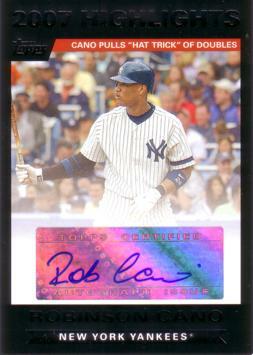 I also collect Cano autographs so this made me happy. I got a card to add to my collection, and got rid of a card that really had no value to me.